Shutting Down Boracay Island: Whatâ€™s At Stake? Shutting Down Boracay Island: What’s At Stake? President Rodrigo R. Duterte has repeatedly warned he will shut down Boracay Island to rehabilitate the country’s most well-known tourism destination. The president announced earlier this year that he would close down business establishments in the island due to non-compliance to environmental regulations. He gave Department of Environment and Natural Resources (DENR) Secretary Roy Cimatu six months to address the problems in the area. In response, the inter-agency task force on Boracay suggested the total shutdown of the island for six months starting April 26. The president has yet to act on the proposal as stakeholders appeal for reconsideration. They argue that the rehabilitation in the island can be done even without closing down all business establishments. If and when the total shutdown of island pushes through, the impact will not just be on the establishments but on the residents as well. The main source of livelihood of the island’s dwellers is tourism. 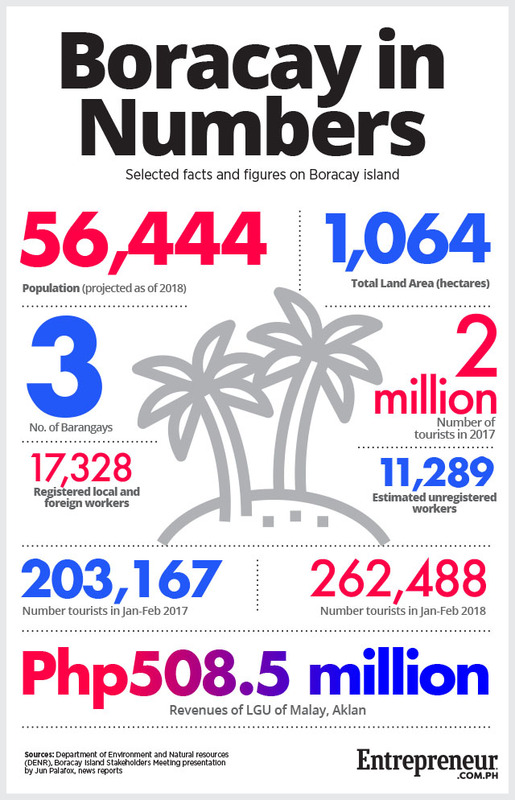 Permanent residents of Boracay Island have been increasing over the years. The population in the island is substantially larger than that of mainland Malay, the town where Boracay belongs. That’s according to figures from architect and urban planner Felino Palafox Jr.’s presentation during the island’s stakeholders meeting in February. In 2018 alone, Palafox projects the population in the island to further increase by nine percent to 56,444 from 51,793 last year. This is 2.5 times more than mainland Malay’s projected population of 22,738. There are also 17,328 registered local and foreign workers, according to Palafox. On top of that, he estimates there are about 11,289 unregistered workers in the island. In 2017, Boracay Island hosted about two million tourists. The entire local government unit’s revenues amounted to Php508.5 million, according to Palafox. One of the main problems of the island the government points out is the improper management of wastes. Since the sewerage system is not properly integrated, human and other wastes from business establishments and residents go directly to Boracay’s beaches. 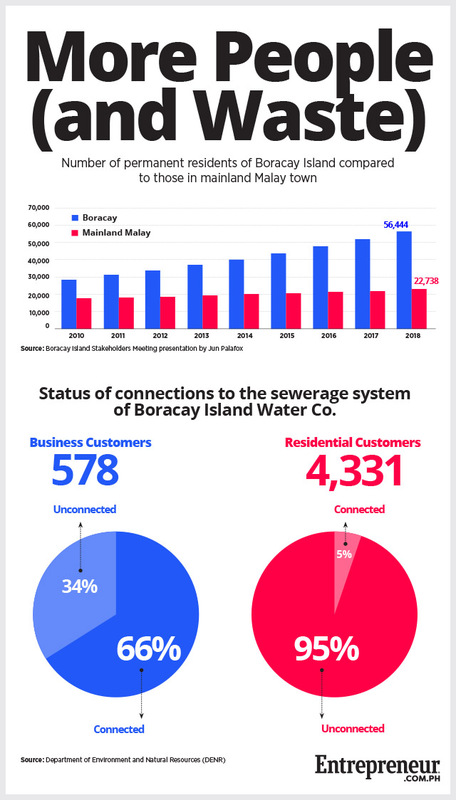 Based on data from DENR and Boracay Island Water Company (BIWC), only 66 percent or 383 out of 578 of BIWC’s business customers are connected to the sewerage system. As well, majority of the residential customers of BIWC are not connected to sewer lines. Only five percent, or 217 out of 4,331 customers, have proper connections to the sewerage system.